Saint John of the Cross explained that when he wanted to express something of his experience of God’s beauty and transcendence, he found poetry a more apt vehicle for what he was trying to say. Perhaps other Carmelites who tried to say something of what they had learned in prayer, also found this to be so. We will look at some of the poetry Carmelites have written over Carmel’s long history, to see if we too can sense a little of the well nigh inexpressible awe and love that poetic intimations of God’s beauty can evoke in us. Please put these dates in your diary now. 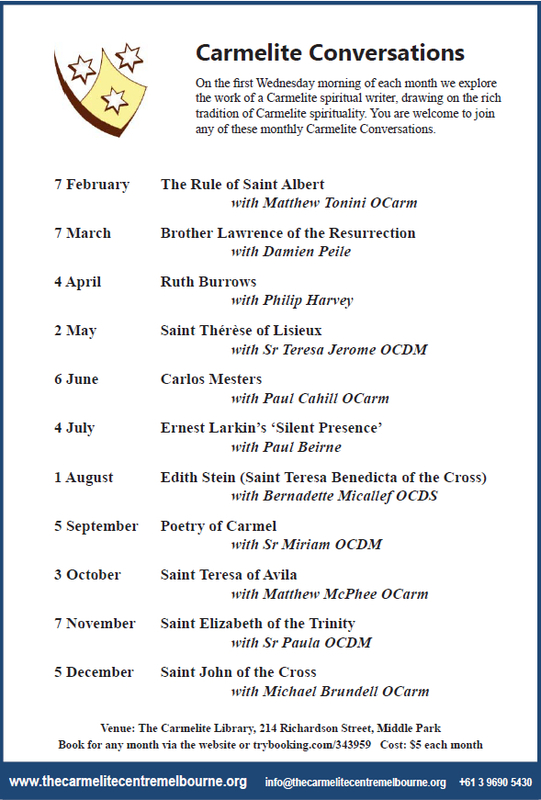 You are welcome to come along to any of these sessions, which are held in the Carmelite Library on the first Wednesday morning of each month February to December, 10.30 am – 12 midday. More details about each one will be provided closer to the date.